NEW YORK - Attorney General Barbara D. Underwood today announced a lawsuit against the Donald J. Trump Foundation, and its directors, Donald J. Trump (“Mr. Trump”), Donald J. Trump, Jr., Ivanka Trump, and Eric Trump. The petition filed today alleges a pattern of persistent illegal conduct, occurring over more than a decade, that includes extensive unlawful political coordination with the Trump presidential campaign, repeated and willful self-dealing transactions to benefit Mr. Trump’s personal and business interests, and violations of basic legal obligations for non-profit foundations. The Attorney General initiated a special proceeding to dissolve the Trump Foundation under court supervision and obtain restitution of $2.8 million and additional penalties. The AG’s lawsuit also seeks a ban from future service as a director of a New York not-for-profit of 10 years for Mr. Trump and one year for each of the Foundation’s other board members, Donald Trump Jr., Ivanka Trump, and Eric Trump. The Attorney General also sent referral letters today to the Internal Revenue Service and the Federal Election Commission, identifying possible violations of federal law for further investigation and legal action by those federal agencies. As alleged in the petition, Mr. Trump used the Trump Foundation’s charitable assets to pay off his legal obligations, to promote Trump hotels and other businesses, and to purchase personal items. 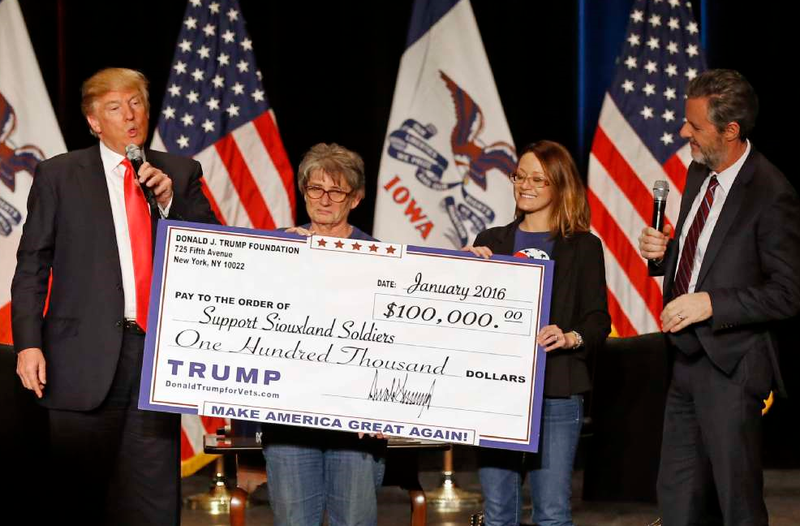 In addition, at Mr. Trump’s behest, the Trump Foundation illegally provided extensive support to his 2016 presidential campaign by using the Trump Foundation’s name and funds it raised from the public to promote his campaign for presidency, including in the days before the Iowa nominating caucuses. Is there any way we can make some disbursements this week while in Iowa? At least five $100,000 grants were made to groups in Iowa in the days immediately before the February 1, 2016 Iowa caucuses. The Trump Foundation also entered into at least five self-dealing transactions that were unlawful because they benefitted Mr. Trump or businesses he controls. These include a $100,000 payment to settle legal claims against Mr. Trump’s Mar-A-Lago resort; a $158,000 payment to settle legal claims against his Trump National Golf Club in 2008 from a hole-in-one tournament; and a $10,000 payment at a charity auction to purchase a painting of Mr. Trump that was displayed at the Trump National Doral in Miami. Following commencement of the Attorney General’s investigation, the Foundation paid excise taxes on three of the transactions and Mr. Trump restored funds for the transactions to the Foundation, but the Foundation has not paid excise taxes on the Mar-A-Lago or Trump National Golf Club transactions. As described in the Attorney General’s petition, none of the Foundation’s expenditures or activities were approved by its Board of Directors. The investigation found that the Board existed in name only: it did not meet after 1999; it did not set policy or criteria for choosing grant recipients; and it did not approve of any grants. Mr. Trump alone made all decisions related to the Foundation. The Attorney General’s lawsuit seeks an order finding that the Foundation’s directors breached their fiduciary duties requiring them to make restitution for the harm that resulted, requiring Mr. Trump to reimburse the Foundation for its self-dealing transactions and to pay penalties in an amount up to double the benefit he obtained from the use of Foundation funds for his campaign, enjoining Mr. Trump from service for a period of ten years as a director, officer, or trustee of a not-for-profit organization incorporated in or authorized to conduct business in the State of New York, and enjoining the other directors from such service for one year (or, in the case of the other directors, until he or she receives proper training on fiduciary service). To ensure that the Foundation's remaining assets are disbursed in accordance with state and federal law, the lawsuit seeks a court order directing the dissolution of the Foundation under the oversight of the Attorney General's Charities Bureau. In addition to filing its dissolution petition, the Office of the Attorney General sent referral letters to the Federal Election Commission and the Internal Revenue Service. These letters set forth in specific detail the underlying facts that have led the Attorney General to conclude that additional investigation and potential further legal action by these federal authorities are warranted. This case is being handled by Matthew Colangelo, Executive Deputy Attorney General, James Sheehan, Chief of the Charities Bureau, Laura Wood, Senior Advisor and Special Counsel, Assistant Attorney General Yael Fuchs, Co-Chief of the Enforcement Section of the Charities Bureau, and Assistant Attorneys General Steven Shiffman and Peggy Farber of the Charities Bureau. This matter is being overseen by Chief Deputy Alvin Bragg and Chief of Staff and Deputy Attorney General Brian Mahanna. Ex. 32 - Joint Motion to Approve Settlement Agreement.